It is an important year for the Bath Women’s Institute as we celebrate one hundred years of inspiring women. The Garden is looking forward to getting all dressed up and hoping to look its best for old friends and new. Our 2015 garden of edible plants takes its creative lead from its roots in North Wales, and down through the years to today’s digital age. It is an exciting year, and the garden is going to be very busy playing its part. 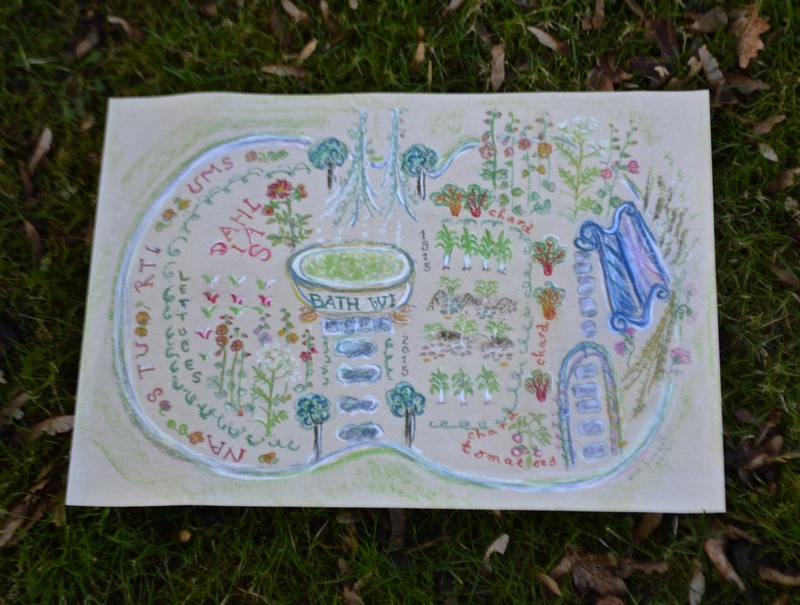 It will be welcoming the community to share and be inspired by the flowers, herbs and vegetables that grow there, or to sit peacefully on the lovely bench, a tranquil haven in a busy world. We hope the design brings memories of old embroidered pictures, framed, and hung on the sitting room walls. The Women’s Institute began in Anglesey, and we hope that our little vegetable patch of potatoes represent those roots, and the leeks pay tribute to Wales. Our hollyhocks bring back memories of cottage gardens, and the sweet peas’ pretty flowers and heady scent evocative of long summer days . Our tomato ‘grove’, a favourite with children, shows them where ‘tomatoes come from’, those tall plants, yellow flowers, and ripening fruit are fun to watch, as are the runner beans as they race each other up the wigwams. The WI bath is filled to the brim with camomile, which bubbles merrily away, and loves all the attention it gets from the many visitors. These same visitors like to name the many herbs that are growing here, such as fennel, rosemary, thyme, bay and sage, all with their ancient medicinal uses, and importance in cooking today. Our dahlias may surprise you, as until Victorian times , they were eaten as a vegetable, their tubers an alternative to carrots or potatoes. But now let’s be up to date with the lollo rosso lettuces, in deep purple and lime green, and the big smile of rainbow chard, a bit flashy, like the laptops and Xboxes of today! We end with a cheerful smile of nasturtiums, their flowers look lovely on salads, and their seeds delicious pickled as capers. The Bath WI, and its garden, uphold the ethos of the Women’s Institute, with its inclusivity, involvement in the community, and inspiration mixed with fun. We hope that you will come and visit, the garden is excited about the new design, and loving having so much to look forward to. Found your pages and thank you for the hard copy of the garden plan.